* There are several great matchups over Labor Day weekend, beginning on Thursday, Aug. 30, but Wolverines vs. Fighting Irish gets the nod because it’s no longer played every year and there’s some bad blood between the programs. Others to watch: Washington at Auburn, Miami (Fla.) vs. LSU at Arlington, Texas (Sept. 2), Virginia Tech at Florida State (Sept. 3). * Dabo Swinney meets Jimbo Fisher again, this time in College Station. Others to watch: USC at Stanford, UCLA at Oklahoma, Colorado at Nebraska, Penn State at Pitt. * Home team has won five consecutive and seven of the past eight in the series. Others to watch: Ohio State vs. TCU at Arlington, Texas; USC at Texas, Alabama at Ole Miss. * Aggies play Clemson and the Crimson Tide in the span of three weeks. That’s some serious scheduling. Others to watch: Wisconsin at Iowa, TCU at Texas, Nebraska at Michigan. * Football doesn’t get much more entertaining than the past two games between the Buckeyes and Nittany Lions, with Penn State’s 24-21 upset win in 2016 and Ohio State’s huge rally for a 39-38 triumph last year. Others to watch: Stanford at Notre Dame, Tennessee at Georgia, Michigan at Northwestern. * Sure, the Longhorns are rebuilding, but don’t count them out of the Red River Showdown. The past four meetings have been decided by seven points or fewer. Others to watch: Florida State at Miami (Fla.), Notre Dame at Virginia Tech, Nebraska at Wisconsin, LSU at Florida. * The Spartans torpedoed the Nittany Lions’ Big Ten East title hopes last year with an upset win in East Lansing. Both teams should be in the hunt for the division title. Others to watch: Wisconsin at Michigan, Georgia at LSU, Washington at Oregon. * Key game for Wolverines coach Jim Harbaugh, who has lost two of three to the Spartans. Michigan State has won eight of the past 10 in the series. Others to watch: Oklahoma at TCU, Auburn at Ole Miss, Alabama at Tennessee. * Tigers have won three in a row in the series, including a 37-34 thriller in the last meeting in Tallahassee in 2016. Others to watch: Wisconsin at Northwestern, Iowa at Penn State, Florida vs. Georgia in Jacksonville. * Though the Crimson Tide has won seven straight in the series, expect a tight game in Baton Rouge, where four of the past five games have been decided by seven points or fewer, including two in overtime. Others to watch: Penn State at Michigan, Notre Dame at Northwestern, Stanford at Washington, Nebraska at Ohio State. 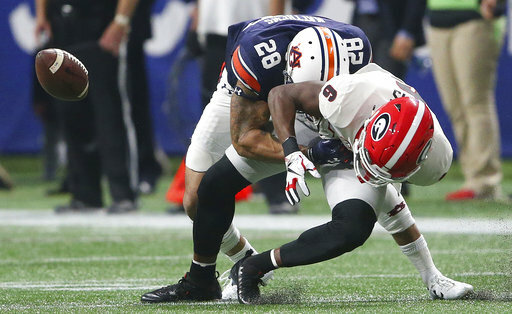 * We were treated to a double dose of the Deep South’s Oldest Rivalry, when the Tigers routed the Bulldogs 40-17 in Auburn before Georgia rolled 28-7 in the SEC Championship Game. College Football Playoff aspirations could be on the line. Others to watch: Wisconsin at Penn State, Ohio State at Michigan State, Florida State at Notre Dame, Oklahoma State at Oklahoma. * This game could decide the ACC Coastal Division title. The Hokies have won four of the past five in Blacksburg. Others to watch: West Virginia at Oklahoma State, Stanford at California, Michigan State at Nebraska. Marquee matchups: There’s more than just one this week, with Michigan at Ohio State in The Game, Auburn at Alabama in the Iron Bowl, Notre Dame at USC, Florida at Florida State, Washington at Washington State in the Apple Cup and Mississippi State at Ole Miss in the Egg Bowl. Sleeper game: Central Florida at South Florida. Conference championship games, followed by the College Football Playoff announcement on Dec. 2. Army vs. Navy in Philadelphia. Rating the conferences: Is Big Ten football really that good?